On July 5th, 2016, the Islamic State in West Africa Province (ISWAP) or better known as Boko Haram, released a 14mn video titled: the Battle of Bosso. Exactly a month ago on June 3th ISWAP militants conducted one of the deadliest attacks on Nigerien forces military base of Bosso, Niger. Video mainly intends to reinforce ISWAP propaganda that regional forces are unable to stop the group from conducting attacks on hard targets and to demonstrate capability of defeating them. Important to note that an initial short video was released June 7th, three days after Bosso attack. However, July 5th video is 12 times longer, has more contents, and much better quality. The video included passages of speeches from Abu Musab al-Zarqawi, leader of al-Qaeda in Iraq (AQI) from 2004 to 2006, was killed in June 2006. Battle of Niger: Part of liberating Nigérien military base in Bosso. The “Battle of Niger” video was in Arabic with a short motivation speech given by unknown leader in Hausa subtitled in Arabic. Recording first highlighted initial successes and brief history of the group while showing images of previous battles and medias releases. Also emphasized group’s commitment to the so-called Islamic State (IS) and its leader, Abu Bakr al-Baghdadi despite recent speculations that the group might attempt to re-join forces with al-Qaeda. Boko Haram/ISWPA brigade leader speaking to fighters before Bosso attack. Surrounded by a crowd of more than hundred militants, what appeared to be a leader, delivered an inspirational speech in preparation for Bosso attack. To summarize his speech, he reminded everyone to remain faithful and pure. This battle is not dedicated for anyone but for the victory of Islam and to lift oneness flag in the sky, and apply Sharia everywhere in the world. He stated that without this attitude no matter how many enemies are killed or weapons seized, means nothing. He ended by reminding everyone to be dedicated, have strong faith, and be patient in order to return victorious, and if killed will be granted a passage to heaven. The brigade leader seemed composed, calm, confident, and articulate during his delivery. Following the speech a convoy made of dozens of 4×4 vehicles, motorcycles, and militants by foot appeared heading to Bosso. 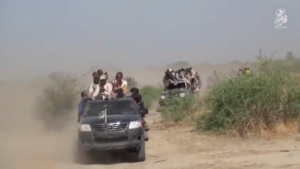 In each vehicle were between 15 – 20 armed fighters that could easily indicate that more than one hundred Boko Haram/ISWAP fighters participated in Bosso attack. A local Nigerien military source told me after the attack in June 3th that the number was more than one hundred and did not believe it, but this video confirmed the claim. Boko Haram/ISWAP militants heading to Bosso June 3th, 2016. After scenes from the attack on Bosso base, at least 15 bodies of dead Nigerien forces were shown. Nigerien authorities confirmed 26 dead while open-source reporting indicated 35 soldiers were killed and 70 injured. This video also confirmed Boko Haram/ISWAP claim of the large amount of weapons seized. From the video weapons and equipment seized include important amount of ammunition, mortars, handguns, technicals, at least six 4×4 vehicles, rocket launchers, machine guns, armored vehicle, military uniforms, rocket-propelled grenade (RPG), and vehicles loaded with important military supplies. While the battle started early in the evening and ended when was dark, the recording of arms and equipment seized took place during a day likely in a different location outside of Bosso. The following morning Nigerien forces reportedly launched an assault on ISWAP and recaptured the village. However ISWAP statement after June 3th attack said the militant group abandoned the village on its own, indicating no intention to occupy a territory. Weapons seized by Boko Haram/ISWAP. Vehicles with mounted machine guns seized by Boko Haram/ISWAP. Despite reports of Boko Haram/ISWAP being weakened and defeated, the group appears to have no shortage of number of fighters able and willing to carry attacks on hard targets, like military base. Southeast Niger witnessed an increase in Boko Haram/ISWAP attacks in 2016, especially in the last two months. The group conducted at least 5 attacks in the area. Nigerien territory might appear easier target and Niger’s Army is among the weakest of countries conducting operations against the group. The amount of weapons and equipment seized by Boko Haram/ISWAP at Bosso, in addition to the important number of fighters, indicates southeastern Niger will most likely witness similar types of attacks in coming weeks and months. Battle of Bosso was important for Boko Haram/ISWAP not only in terms of weapons seizures, but also created further division and tensions among communities based in the region. This could eventually benefit the group in terms of recruitment or collaboration with armed militias unhappy with local authorities. People fleeing their villages Niger lost its first line of defense, and with limited Nigerien security resources to control remote areas will provide Boko Haram/ISWAP militants ideal fallback areas, especially with increased pressure in Cameroon and Nigeria.